Chances are, you feel guilty about it already, but here it comes: While 93 percent of us believe breakfast is the most important meal of the day, 56 percent of us skip it. Why? Well, chances are you know the answer to that, too: We’re really busy. In fact, according to NPD Group, Americans spend 13 minutes each day eating breakfast. (Another estimate puts that time at a mere six minutes.) Of course, brands like Kellogg’s are well aware of the situation. The challenge for most any breakfast brand lay not so much in convincing consumers that the product is tasty, but that it’s convenient and nutritious enough simply to make time for. That was certainly the case in 1943 when this ad for Kellogg’s Corn Flakes appeared in the magazines of America. With the war on, 37 percent of American women had taken jobs in factories. Not that their jobs freed them from the obligations of taking care of the kids, of course. The result was a window for breakfast every bit as small as today’s. 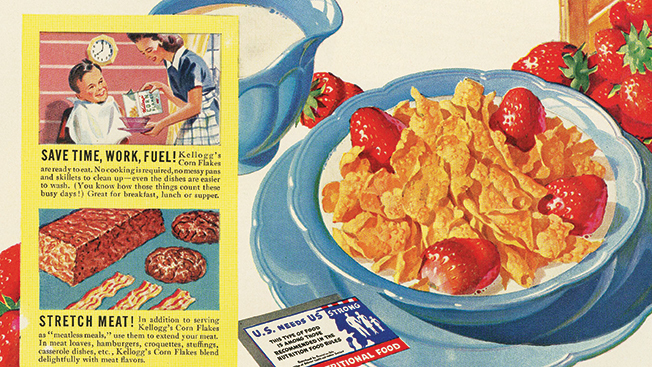 Kellogg’s responded to this reality with a shrewd message, pointing out that Corn Flakes was mainly a time-saver (mentioned in three different places in this ad), even as it offered the correlative benefits of nutrition and usefulness in preparing other meals. Just like it did 71 years ago. Funny thing, though: America figured out how to win a world war but still can’t figure out how to find time to eat breakfast.